I've been doing a Facebook poll on my ASAP Workouts page over the weekend for doing some online coaching in 2018. Individual coaching, limited to a small group that I cover. Generalized coaching, like s small group 'boot camp' class structure, where everyone is following a similar program and getting coaching on modifications to the program. So far, individual coaching is in the lead. You still have some time to vote. You can take the poll here, as I've embedded it into the post. I could also offer two small groups of each as well. Been running that idea around in my head as well. Either group I create will have its own special private FB group that I add you to. Please feel free to message me over FB if you have any private questions about the coaching plans/options. No, it is not "Fitness All In My Mouth" day, either. Just because its the weekend it doesn't mean it is time to ruin your gains. On International Bicep Curls Day in the gym this week, we'll add in another IYBPB50# workout to the slate and you can do your curls after that if you'd like. If you've been doing these workouts, you'll have 4 more weeks to go and be already boosted up for making some solid gains in January. Maybe at the end of January, you can be strutting around the gym in this shirt and be able to tell folks, #WHYBY? 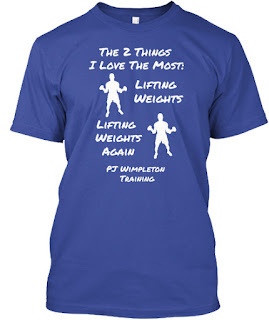 Grab this shirt and check out many other cool ones at the PJ Wimpleton Fitness Shop! Today's fitness tip: drink your water, fella. Nothing keeps a body from gaining strength than dehydration. Make sure you're getting enough in you to keep your body running smoothly. 3/4's to a full gallon ought to be well enough for most people. Don't overdo this either. It may be easier just to fill up a 20-32 oz bottle and start drinking a few of those per day. You'll get liquids at meals and other times throughout the day too. Stay strong and see you on New Year's for a great start to 2018! Find a good challenge to do in 2018 at http://tinyurl.com/rkofp , like the "Just Swing It!" kettlebell swing challenge! I didn't get any newsletter out on Christmas, so you'll get two workouts today: so, its sorta like Christmas, getting 2 workouts instead of one! Today's fitness tip is about working out when you're sick. Why? Because, I just got over being sick and was wiped out with the flu. Don't force yourself through a workout if you're sick. You're sick, you need to rest and recover, so don't force your body into a state it doesn't need to be in (like super, super tired and wiped out even more). Getting wiped out by the flu is usually a good time to take a break and recover as much as you can. Now, if you have the sniffles and a small cold, play it by ear. Maybe workout for half the time you planned for, like a 15 minute walk/run instead of 30 minutes, or just a couple sets per exercise instead of 4-5 sets per exercise. Even if just a few things feels like too much for you, don't force yourself through it. Take a break. What's better than lifting weights? Lifting weights, again! Get this shirt at the PJ Wimpleton Fitness Shop! It's another Bench Day in the IYBPB50# routine. - Get a spotter on these! Grab this sweet shirt at the PJ Wimpleton Fitness Shop! If increasing your bench press is like a super-top priority in 2018, you might want to check out this plan from Critical Bench! Also, all this lifting can make some bodies pretty sore and tight. If your hips are bothering you, check out this program to help loosen things up! Also, 1 scoop of Slim-Fast into a cup of Sunny Delight is a smooth tasting drink as well! Train Hard & Train the PJ Way! My workouts the past few weeks have been a good mix of kettlebell swings, cleans, clean & presses, and some dumbbell circuits following the HWR patterns of 20/10 work/rest. 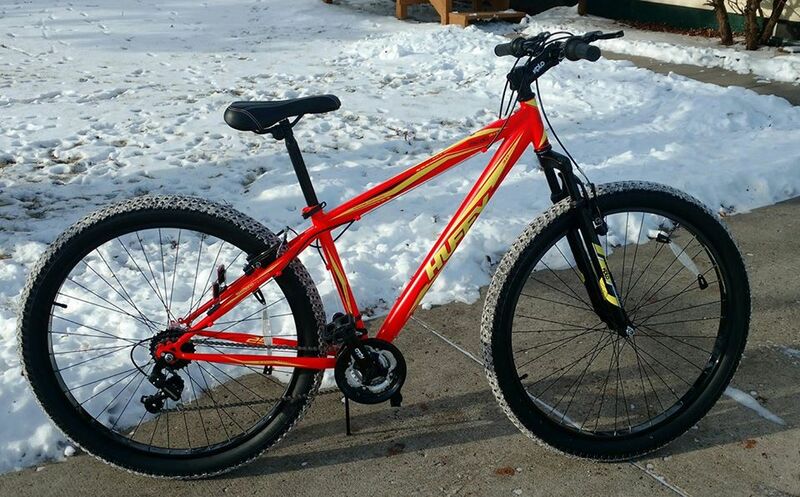 I also got a "29er" bike as a way to still take in some snow rides this winter. I sold my fat bike this summer, and decided to get a 29'er instead, as it takes up less space and still has a good, thick tire to pedal on snow/ice. Huffy had a good sale on their 29", 3.0 tire (3" wide tire) Torch model and it came last Thursday. I do like the blaze orange color of the frame for its high visibility in winter, and of course, any other season to ride it in. I have some adjustments to do on the front brakes, but other than that, its a good bike to ride. It should be a fun, all-seasons bike to take out. Overall, it adds some more options for me in working out this winter when I can get outside for a ride. I've also been working on the "PJ Way" side of things with my Train The PJ Way newsletter I've been putting out on Facebook and over email. You can get on the email list and also get a link to the "Seriously Awesome Guide to Seriously Awesome Fitness" when you go to this page. I'm mainly selling t-shirts on there and also connecting people to my training guides on Kindle, plus telling people about AdvoCare products, too. T-shirts are a great gift, find them at the PJ Wimpleton Fitness Shop!